Cut two 9″x 13″ rectangles of fusible fleece, Kona solid and laminated cotton. Place zipper right side facing the right side of laminated cotton and then place right side of Kona cotton facing laminated cotton with zipper sandwiched in middle. Pin in place and stitch down across top. Repeat step 3 on other of zipper. Top stitch along side of zipper on each side. You will be sewing through all 3 layers (laminated, kona and zipper) You do not even need a zipper foot for this project since it is an exposed zipper look. Quick tip* To make top stitching laminated cotton easier just tape a piece of scotch tape to bottom of sewing machine foot to help the fabric slide under presser foot. Fold at zipper with laminated sides facing each other and pin all layers together at bottom. Then stitch pinned seam across bottom. Zig Zag outside of sewn seam and trim off excess fabric. Fold 2″x7″ tab into center and fold again. Stitch down each side of tab for a finished look. Match up zipper with bottom sewn seam. Place tab sandwiched in middle with folded center inside bag. Pin in place. 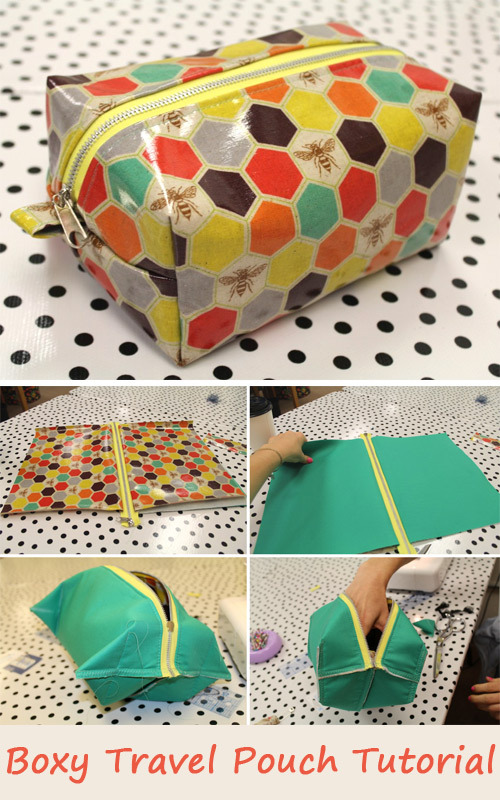 Stitch down both sides of bag where you pinned zipper, seam and tab into place. Zig zag stitch outside of seams and trim excess fabric. Repeat on other side. Mark with chalk 2″ on down side of each of the four corners. Fold out each corner, lining up 2″ mark you made with center of triangle. Then draw a line across at 4″ on each corner. Each corner should look like this. Then you sew across the 4″ line you made through all the layers on each corner. Repeat on each corner. This will create the box shape of bag. Zig Zag stitch outside each seam and trim off excess corner fabric on each of the four sides. Trim all lose threads and flip bag right side out. And you are done! This makes a fun travel bag, toiletry bag, makeup bag, pencil bag or any other bag you’d like. Their are sooo many fun fabrics to choose from for a whole new look. I hope you enjoyed this easy box bag tutorial.